Product #15707 | SKU P-CELLPOD | 0.0 (no ratings yet) Thanks for your rating! Based on the original UltraPod™, the CellPod® features an adjustable mount that holds the iPhone®, iPod touch®, Zune® HD, Sony S Series™, Palm Pre™, Blackberry® phones and other similar devices. Using the UltraPod® I as a base, this uniquely adjustable mount positions the screen at the correct viewing angle on airplane tray tables, desk tops, or just about anywhere indoors or out. Take stable photos, use the speaker phone, or watch videos—your imagination is the only limit. The adjustable mount utilizes brass and aluminum hardware, which securely holds the phone horizontally or vertically. Unlike other stands or cradles, the CellPod is also a fully functioning, universal mini-tripod for point and shoot digital cameras. 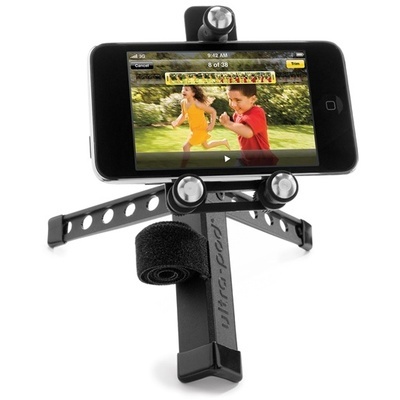 Simply remove the CellPod mount and you have the UltraPod™ I tripod. The included Velcro® strap allows the device to be attached to just about anything under 3" in diameter: trees, railings, exercise equipment, etc.